Absolutely Free! The players of the T206 Sporting Life ads. 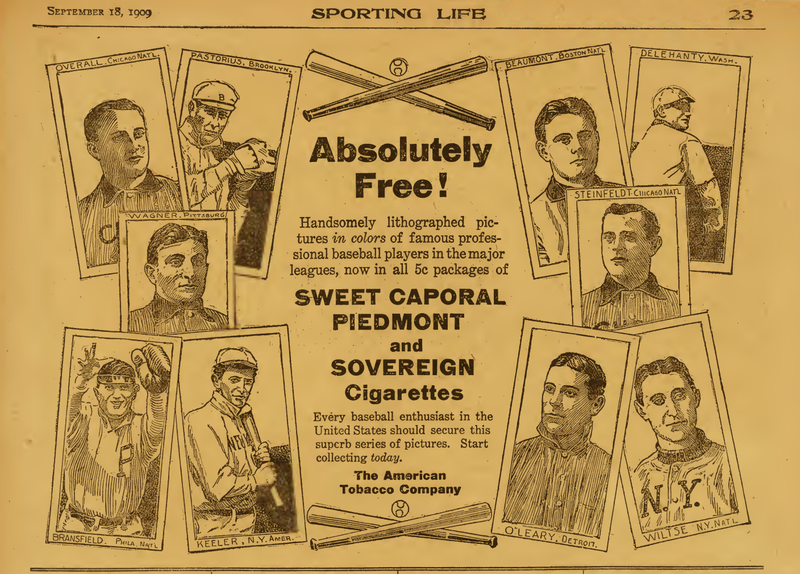 In the summer of 1909 The American Tobacco Company placed some ads in the Sporting Life publication. The ads were for cigarettes. Sweet Caporal. Piedmont. Sovereign brand. 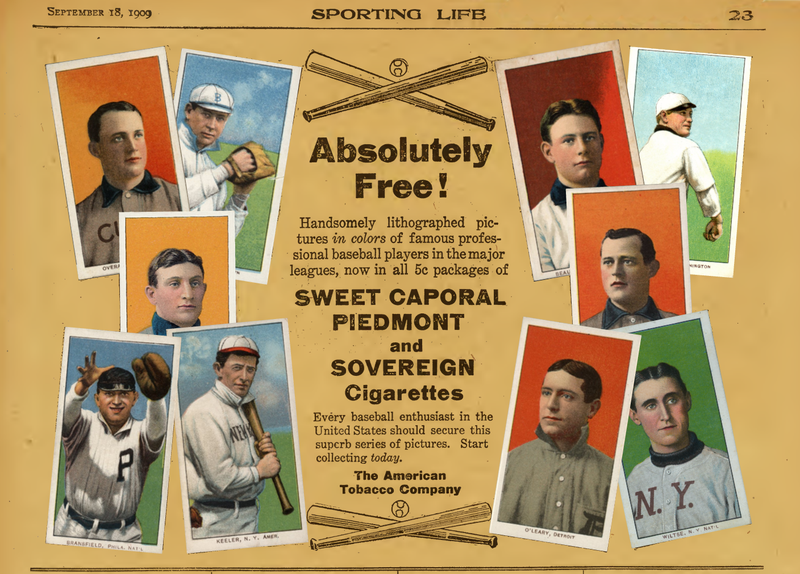 The packs featured cards of baseball players. The ad first ran in the July 3 edition and finished up in the September 18 edition of the paper. Handsomely lithographed pictures in colors of famous professional baseball players in the major leagues. Every baseball enthusiast in the United States should secure this superb series of pictures. Start collecting today. The images are drawing of the cards Jefferson Burdick designated as T206. For a great read on that set, download Scot A. Reader’s Inside T206 – A Collector’s Guide to the Classic Baseball Card Set (Centennial Edition). For this second ad, why these players? Were they the stars of 1908 / 1909? Let’s take a look. I’ve placed letters to easier identify which card / player I’m discussing. I’ll try to determine why, based on previous performance, they were part of the ad campaign. Maybe some totally different reason. Some say that you’re only good as your last at bat. Part of the “what have you done lately” syndrome. 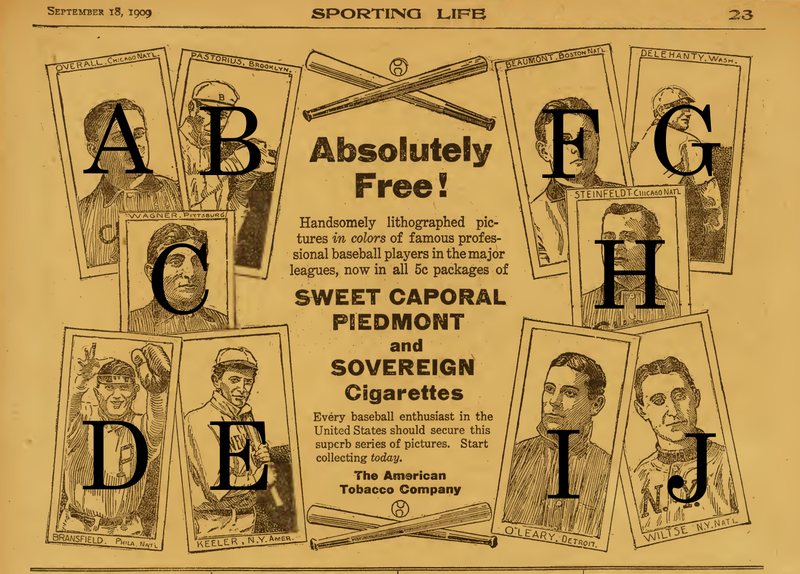 When this ad was published there were less than 20 games left in the 1909 season. A. Orval Overall, Chicago, National. A pitcher for the Cubs since 1906. Led the National League in Shut Outs in 1907 (8) and 1909 (9). Led the NL in Strike Outs in 1909 (205). Orval finished the 1909 season with a 20-11 record with a 1.42 ERA. The Cubs finished second in the NL standings, 6.5 games behind Pittsburgh in 1909. B. Jim Pastorius, Brooklyn. A pitcher for the Superbas since 1906. In 1908 he posted a 4-20 record. In 1909 it drooped to 1-9. In 1909 Brooklyn finished sixth in the NL standings, 55.5 games behind Pittsburgh, his home town. Brooklyn released him on August 28, 1909, just three weeks before this ad ran. C. Honus Wagner, Pittsburgh. We now know that he would enter the Hall of Fame in 1936. Back then it wasn’t yet a destination. He’d been playing with Pittsburgh since 1900, clearly an established player for his team, and in the majors. Where to start on his accomplishments of 1908 and 1909? For 1908 he led the NL in Hits (201), Doubles (39), Triples (19), RBI (109), Stolen Bases (53), BA (.354), Total Bases (308), plus a few other categories. He seemed to slow down a bit in 1909. He led the NL in Doubles (39), RBI (100), BA (.339), Total Bases (242) and several other categories. The World Series didn’t take place until October of 1909. The Pirates won. D. Kitty Bransfield, Philadelphia, National. A first baseman for the Phillies since 1905. His stats show nothing outstanding. A solid player with a .303 BA in 1908 and .292 in 1909. He was fifth in the NL with 160 Hits in 1908. He had a .989 Fielding % as a first basemen in 1909, leading the NL. The Phillies finished fifth in the NL standings, 36.5 games behind Pittsburgh in 1909. E. Willie Keeler, New York, American. An outfielder with the Highlanders since 1903. He entered the Hall of Fame in 1939. Again, it wasn’t yet a destination. In 1908 his BA was .263. In 1909 his BA was .264. Most of best playing seasons were years before. Born in 1872 he was the sixth oldest player in 1909. He left the major leagues in 1910. New York finished fifth in the AL standings, 23.5 games behind Detroit in 1909. F. Ginger Beaumont, Boston, National. Outfielder for the Doves since 1907. He led the NL in hits in 1907 with 187. His BA in 1908 was .267 and in 1909 it was .263. Probably his best year in baseball was 1903 when he was with Pittsburgh. Boston finished in the cellar of the 1909 NL, 65.5 games behind Pittsburgh in 1909. G. Jim Delahanty, Washington. One of the five Delahanty brothers. Jim joined the Senators as an infielder in 1907, having been with five major league teams since 1901. In 1908 Jim had a .317 BA and for his time in Washington for 1909 he had a .222 BA. Nothing else those years scream out, “Jim was a great player.” On August 13, 1909, he was traded to the Detroit Tigers. Washington finished the 1909 season at the bottom of the AL, 56 games behind Detroit in 1909. H. Harry Steinfeldt, Chicago, National. Harry joined the Cubs playing third base in 1906, having been with Cincinnati for the previous eight seasons. In 1906 Harry led the NL in hits (176) and RBI (83). In 1908 his BA was .241 and he raised it to .252 in 1909. The Cubs finished second in the NL standings, 6.5 games behind Pittsburgh in 1909. I. Charley O’Leary, Detroit. Charley joined the Tigers in 1904 as a short stop. In 1908 he had a .251 BA and it fell to .203 in 1909. Seemingly a solid player, but not a star player. Detroit won the AL pennant in 1909 but fell to Pittsburgh in the World Series. J. Hooks Wiltse, New York, National. A pitcher for the Giants his whole career in the NL he started with them in 1904. He led the NL in HR given up with 9 in 1909. A reliable hurler, he went 23-14 in 1908 and 20-11 in 1909, his only 20+ win seasons. The Giants finished in third place, just 18.5 games behind Pittsburgh. What have I deduced from looking at these players? Why were these ten chosen for this ad? One solid star, Honus Wagner. A few other above average pitchers, Overall and Wiltse. A couple players that were probably household names, Delahanty and Keeler. What about the league breakdown? National League: 7 players (two Cubs). American League: 3 players. Position players vs. pitchers? Position: 7. Pitchers: 3. What about the age of the players? I’m taking their age from Baseball-Reference for the 1909 season. The average age of the ten players is 31.6. The youngest being Pastorius, 27 and the oldest, Beaumont, 37. By league, the NL players are 30.9 and the AL players are 33.3. I really don’t know why these players were chosen. Aside from Wagner, I really don’t. I should go back and look at the first ad in the Sporting Life to see if there’s any insight. Future post, I guess. Let’s not stop the fun with speculation. Since the ad copy says “in colors” I thought I’d modify the original, inserting digital copies of the actual T206 cards. Author mdaubreyPosted on January 11, 2017 January 25, 2017 Categories TobaccoTags advertising, tobacco cardsLeave a comment on Absolutely Free! The players of the T206 Sporting Life ads.